On this page I'll collect (links to) sample scripts and commands for unattended and silent software installations (and migrations). My definition of an unattended installation is any installation that does not require user input but may display dialogs or progress bars etc. Silent installations are installations without any visible interface elements. The main focus will on installing software, drivers, etcetera in Windows (NT 4 and later, not 9*/ME), not on installing Windows itself, though some links will be provided. I won't restrict myself to a single script language, the goal is getting the job done. For example, a batch file's startup directory can be made the working directory by starting with the command PUSHD "%~dp0" (don't forget the POPD command at the end of the batch file). This is explained on my Clever Tricks page. Use the full path to files and executables if possible, instead of assuming they will be located in the current directory. Use "%~dp0command_name.exe" if an executable is located in a batch file's own startup directory. After issuing any command, check its return code or "ErrorLevel" to see if it succeeded or failed. Check the current Windows version, and if necessary write different subroutines for each Windows version. Many companies associate .VBS with Notepad, as a safety precaution, to block macro viruses. Always run VBScript files with the CSCRIPT command, or use my VBSAssoc.bat to temporarily change the .VBS file type association (don't forget to call restore_vbs_assoc.bat at the end of the installation to restore the original file type association). And last but not least, log the results of each action of your install scripts. One of my installation batch files once returned an errorlevel that seemed to be random at first. After several days I found out that emptying an already empty environment variable (SET varname=) will result in an errorlevel 1, whereas the errorlevel will be 0 if the variable did have a value before emptying it. If you intend to use an installation batch file in a package (Wise, SMS, MSI, ...) you may want to perform the error handling yourself, and end the batch file with the command EXIT 0 to make sure the package won't be uninstalled because of an unexpected errorlevel. Now all you need to do to test the intermediate errorlevels is set environment variable %DEBUG% to any value and rerun the batch file. /F:"filter_string" restricts the returned list to software that has a description which includes filter_string. With the optional /R switch the filter is interpreted as a regular expression. Find the uninstall string for the software you want to uninstall. This is the command for an interactive uninstall or repair! If you're lucky, you'll find the command line switch(es) for unattended (un)installs in the documentation or by using the /? or -? switch. If not, you can sometimes find undocumented command line switches using STRINGS. But sometimes you may just need to guess what command line arguments will make an (un)install silent. Try dashes instead of forward slashes too (-S instead of /S), and check both upper case and lower case. Preparing harddisks for a new operating system is tricky, because it can be done only when you boot from another medium like a floppy disk, CD-ROM or bootable USB stick -- or another harddisk. • Probably the most well-known tool to (re)partition harddisks is FDISK. FDISK is a native DOS command, so if you created a bootable DOS diskette you probably have a copy of FDISK.EXE or FDISK.COM available. From my own experience, however, I would advise against using FDISK on modern computers. FDISK has been known to miscalculate partition sizes and create overlapping partitions. In most cases you wouldn't notice this until a partition is almost completely filled with data, which will then be lost. • If you still own a copy of an old Norton/Symantec Ghost version, you can use GDISK to (re)partition harddisks. Copy GDISK.EXE to your bootable medium (floppy disk, CD-ROM, USB stick). GDISK.EXE is for 16-bits DOS; if you boot with a 32-bits OS, like BartPE, use GDISK32.EXE instead. Boot from that medium and issue the command GDISK without any command line arguments to list all harddisks with their numbers. This is especially important if you boot from a USB medium, as this may often be recognized as harddisk 1, and the internal harddisk as harddisk 2 (depending on the computer's BIOS and the type of USB medium). And we wouldn't want to accidentally repartition our bootable USB stick or external harddisk, now would we? GDISK 2 /DEL /ALL will erase all existing partitions on harddisk 2. GDISK 2 /MBR will recreate a standard MBR on harddisk 2, important if the harddisk was somehow encrypted, like (IBM) laptops with their BIOS password set. GDISK 2 /CRE /PRI /SZ:4096 /FOR /Q /V:SYSTEM will create a new 4GB primary partition labeled "SYSTEM" and quick-format it. GDISK 2 /CRE /EXT will create an extended partition on the rest of the disk. GDISK 2 /CRE /LOG /FOR /Q /V:DATA will create a logical drive using the entire extended partition, label it "DATA" and quick-format it. Read Symantec's detailed explanation of all GDISK command line switches. Caution: As always, test these commands thoroughly on the type of computer you intend to use them for. By default, Windows is installed with DHCP enabled for all network adapters. However, you probably want to use static IP addresses on servers. This is where NETSH is put to good use. NETSH is available on Windows XP and later versions. I won't describe all NETSH's command line parameters, as there are enough to write a book on it. Start by typing NETSH /? on a command prompt and explore from there, if you have some time to spare. What I will describe is how to create your own NETSH scripts. As an example we'll use NETSH to set a static IP address for a network adapter, instead of DHCP. 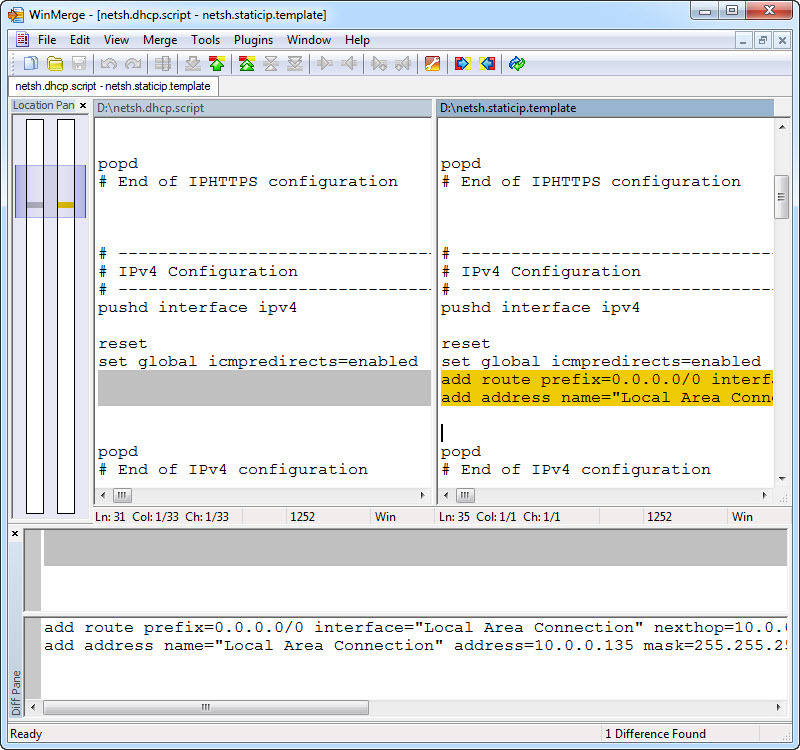 Note: On the computer used in this example, Autoconfiguration (or APIPA) has been disabled. This is not the default setting, by default it will be enabled. My APIPA.bat and/or APIPA.vbs scripts can help you change or restore APIPA settings. Now we'll change the network adapter's IP settings manually. Open the Network Connections properties, next open the network adapter's properties, and than the TCP/IP properties. Click "Use the following IP address" and fill in all required IP addresses. When finished, click "OK" and close the dialogs. This section was written for Windows XP and TCP/IP v4. We could copy the template to a separate script for each server, and adapt the addresses manually. To set static IP address 10.0.0.156 on another server, run the batch file above with 156 as its only command line argument. Notes: 1 The lines added by the batch file are the lines we removed from the template. The batch file shown here is meant as an example only. If the lines you removed from your template file were different from the lines shown here, modify your batch code accordingly. (this should be a single command line; note the use of dots instead of escaped doublequotes, due to command line restrictions). This command modifies one line in the file netsh.staticip.template and saves the result as netsh.staticip33.script. The /RC switch tells the script to return the number of matches as the return code, so IF %ErrorLevel% EQU 1 can be used to test for successful replacement. CSCRIPT //NoLogo SFaR.vbs /I:netsh.staticip.template /O:netsh.staticip33.script /F:" source=static addr=10.0.0.1 mask=255.255.255.0" /R:" source=static addr=10.0.0.33 mask=255.255.255.0"
3 The example above stems from ancient times - the Windows XP and IPv4-only era. Though the technique discussed still applies, the number of lines that would have to be added to the batch file would make it impractical. This isn't that much code to create on the fly. The following batch file dynamically creates and executes a temporary script to set a static IP address. Notes: 1: The batch code above is meant as an example only. Your NETSH scripts will most likely be different, and so will the required batch file! 2: In the batch code above, the temporary script netsh.static.temp.script will be deleted after being executed, unless NETSH returns an ErrorLevel higher than 0. Admin's Guide to Server Core Commands. As we are discussing software installations, we will focus on local users and groups. However, since we'll be using the NET command, it won't be that hard to translate the commands to domain users and groups. creates a new user account and sets its password. This works for Active Directory too, the new account will be added to the "Users" container. In Active Directory, the DS Tools are the preferred tools to manage user accounts, groups, computer accounts and OUs. Many commands on my Useful Commands for Windows Administrators page can be useful for unattended installations too. Permissions on files and folders can be set using CACLS or its Resource Kits counterparts XCACLS or SUBINACL. SUBINACL can even be used to find and replace permissions. To change ownership a third party tools like SUBINACL is required. Or wait a minute, is this true...? Using MMC to create custom security templates, you can use SeCEdit to apply them unattendedly. This way you can set permissions, inheritance and/or ownership on files, folders, services and registry keys. Read more on my SeCEdit page. Or download and use Microsoft's SUBINACL.EXE, which allows a little more "detailed" permissions configuration. For registry changes, REGEDIT is the tool to use. It may not be as simple to use as REG.EXE, but at least its command line usage has remained unchanged since Windows NT 4. If you plan on using REG.EXE, on the other hand, you'll need to check its version and modify the command line(s) accordingly. REGEDIT.EXE regfile.REG imports (or merges) regfile.REG into the registry. /S makes this a silent import (by default the user is prompted for confirmation, and the import is confirmed afterwards). START /WAIT makes the batch file wait for REGEDIT to finish the import. Note: It is possible to use SeCEdit to manipulate registry values, but it is not as simple to use as REGEDIT. If you also need to set permissions in the registry, do have a look at my SeCEdit page. If you don't need to change anything but permissions in the registry, you may want to check out Microsoft's SUBINACL.EXE. • Use RUNDLL32 PRINTUI.DLL,PrintUIEntry to install and configure printers. RUNDLL32.EXE and PRINTUI.DLL are both native in Windows 2000 and later (as a matter of fact, RUNDLL32.EXE has been around a lot longer, as you might guess after taking a look at my RUNDLL page). With PRINTUI.DLL you can add, configure and delete printers and printer drivers, both local and remote. The command line switches can be supplied on the command line or read from a file. • If you prefer VBScript (or actually WSH, including VBScript and JScript), PRNADMIN.DLL is the tool for you. PRNADMIN.DLL is part of the Windows Server 2003 Resource Kit, which can be downloaded for free. Though PRNADMIN.DLL was available in the Windows 2000 Server Resource Kit too, it is not available in the free Windows 2000 Resource Kit Tools for administrative tasks download. Unlike PRINTUI.DLL, PRNADMIN.DLL can be used to create printer ports too! • If you need to migrate a single printer, use my ExpPrnDr.bat (Export Printer Driver) instead. Tested only on Windows XP, may work on Windows 2000. • With Microsoft's PrintMig tool you can create backups of your complete set of printers, ports, drivers, print processors and print monitors. I successfully used it on Windows Server 2000 and 2003, with some manual tweaking afterwards for the latter. • For Windows Server 2008, Windows Vista and Windows 7, PrintMig should no longer be used. Instead, use the Printer Migration Wizard, or the PRINTBRM.EXE command-line tool located in the %windir%\System32\spool\tools folder. Granted, this isn't a completely unattended installation, as it will still ask for confirmation from the user. But, hey, it's simple! There are several ways to install or migrate Scheduled Tasks. • For Windows NT 4 use the AT command to list all tasks, and reschedule them again with that same AT command. As I doubt this will be used very often nowadays, I won't go over the details. Analyze the results and use JT to rebuild the tasks. to set the credentials on the target computer. • For Windows XP and later, SCHTASKS is the preferred command. The procedure is the same as described for JT, but with different command line arguments. Automating the migration (inventory) may be more of a challenge, because of SCHTASKS' more verbose screen output. In Windows 7 (and maybe Vista too?) an extra challenge will be the dispersal of scheduled tasks over several locations. You may want to use JT for the inventory, and SCHTASKS for creating the new jobs. For Windows Vista and later, consider using the Task Scheduler Scripting Objects with VBScript (or any other COM aware scripting language). For Windows 8.1 and later, consider using PowerShell's New-ScheduledTaskAction cmdlet to create scheduled tasks. Note: It goes without saying that to migrate scheduled tasks, you first need to migrate the programs executed by these tasks. • Many hardware drivers come as .MSI files, in which case you can (un)install them like any other .MSI package. If the path or file name of the .INF file contains spaces, use the short file name notation. Never use quoted long file names! To use encryption we will need keys and certificates. CERTREQ and CERTUTIL from the Windows Server 2003 Support Tools can be used to query and manage (CA) certificates without user interaction. CSCRIPT.EXE //NoLogo GetRunDL.vbs | FIND.EXE /I "cryptext.dll"
CryptExtAddCER will open the wizard to add a certificate with a .CER extension, CryptExtOpenCER will display a .CER certificate's properties dialog. You can use KiXtart's or VBScript's SetFocus( ) and SendKeys( ) functions to "click" through the wizards' dialogs. If you use this method in automated installations, make sure a user is logged in and understands that he/she should not touch the mouse or keyboard until the installation is finished. Otherwise, if the wizard's dialog looses focus the installation will fail. Microsoft's CAPICOM in conjunction with KiXtart, VBScript or (Object) Rexx can also be used to manage certificates. Or use WinHttpCertCfg or CertMgr, both from Microsoft too. Use Windows Installer (executable name: MSIEXEC.EXE) to install .MSI files. The latter does not require the original .MSI file. The unique identifier can be found in the registry under HKLM\SOFTWARE\Microsoft\Windows\CurrentVersion\Uninstall, it is the name of the subkey. You may also want to take a look at the UninstallString values under each subkey. My own GetUnins.vbs uses this technique. More details and links are available on my MSIEXEC.EXE page. Instead of devising your own silent installation routines for each application, you may want to consider using portable applications instead. A portable application is an application that does not need to be installed, and can be run from a removable, local or mapped network drive. Just copy the files to their new location and run the application. Though originally intended for use on USB sticks, these portable applications are perfect for quick deployment to local disk drives. A great source for preconfigured portable applications is PortableApps.com. Unattended and silent installations, Get info from MSI files and Extract CAB files from MSI files by Adriaan Westra.